Help! The world is so immoral and evil at times, how can I protect my kids from it? Do I force them to go to church, or put them in a Christian school to be safe? How do I build loving relationships with my children so that when I give them advice or share God's truth, they will listen to me? When and how do I discipline or give them grace for things they shouldn't have done? Author Kent McClain spent years researching God's Word to find answers to these and other difficult parenting issues, working as a pastor, associate pastor, children and family life minister, youth director, Christian school superintendent, teacher, coach, parent and grandparent Using 1,100 verses in 422 passages he offers insight and helpful direction in Teachable Moments to guide and assist parents in their role as mentor, discipler, disciplinarian, provider, teacher, and friend. 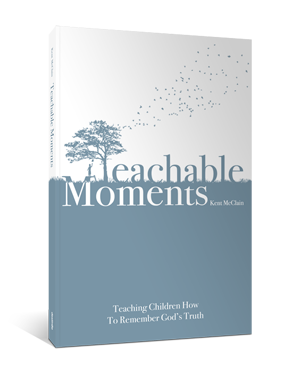 He follows with the companion book, Sowing Teachable Moments Year One, that includes 24 illustrative teachings that encourage parents and children to interactively share and learn together the great truths of Scripture. "Love!" he says. Love the children God puts in your life. Build an intimate bond with them that leads to a relationship with God, the ultimate source of all peace and joy. Teach them the Scriptures in a way that they will never forget their beloved creator and the life-sustaining truth of His Word. And disciple them so they can handle the many challenges of this world.